With temperatures dropping, all we want to do is hide under the covers with a steaming cup of hot cocoa. These cabin-inspired interiors from the designers at Dering Hall are precisely the inspiration we need to prep for the winter months ahead. Nothing says holidays more than snuggling up in a blanket next to a toasty fireplace. If you don't have one this winter, these Dering Hall photos might entice you to design your own. It is not always that we can experience the best things in life much more when everything is in reach during the holiday season. Yes, a hot cocoa in a soothing ambiance from a soft palette of colors in our home is one. But more than that, these 50 fireplace designs that keeps you warm through the holidays and beyond keep your thought a working. Kirstin Havnaer, a Pacific Northwest native who was raised in a family of homebuilders, architects, and artists, founded Hearthstone Interior Design LLC in 2002. Kirstin’s upbringing naturally engrained in her an undeniable sense of the power of aesthetics and functionality in the home. Despite this intrinsic understanding, Kirstin took what some may call an untraditional path to becoming an interior designer. As fate would have it, this path has led Kirstin, and Hearthstone Interior Design LLC, to become an even more exceptional and unique company. Professional kitchen renovations combine style and elegance when crafting a kitchen. Often professional kitchen renovations will include design, installation and construction. The 20th annual HGTV® Dream Home, a 3,100-square-foot Caribbean-inspired getaway with spectacular water views, is located in a tropical paradise: Merritt Island, Florida. The reimagined seaside retreat is the perfect stage for Ethan Allen furnishings, many of them crafted by hand in the company’s North American workshops. DANBURY, Conn. - For the 10th consecutive year, Ethan Allen will serve as the primary source of furniture and décor for the HGTV Dream Home, set to be revealed on a network special on New Year’s Day. The 20th annual HGTV Dream Home, a 3,100-square-foot Caribbean-inspired getaway with spectacular water views, is located in Merritt Island, Fla. This is the first time that HGTV has opted to remodel an existing home, instead of building a new one. The home will be awarded to the winner of the HGTV Dream Home 2016 Giveaway. 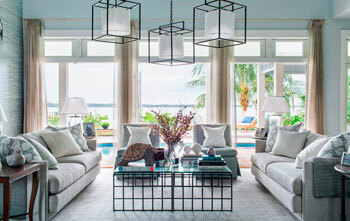 The remodeling transformation was the creative work of HGTV Dream Home designer Brian Patrick Flynn, who shopped the Ethan Allen Design Center in Manhattan to select the furniture, upholstery, window treatments, and accessories that would make his vision for a sophisticated Floridian escape a reality. Flynn chose a cool palette of blue-grays and ivory with some punches of terracotta. He filled the breezy home with an array of Ethan Allen styles, all suitable for its coastal chic vibe. For a virtual tour of the home, visit here.